This system is available in two versions, one based on Intel 87C196 CPU and the other with Motorola’s 68332 Micro-Controller. The resources include 88 DIPs, 100 DOPs, 48 Analog Inputs, 12 Analog Outputs, 4 RS-422 channels & one MIL-STD-1553B interface. Digital outputs - 100 Nos. Analog inputs - 48 Nos. Analog outputs - 12 Nos. 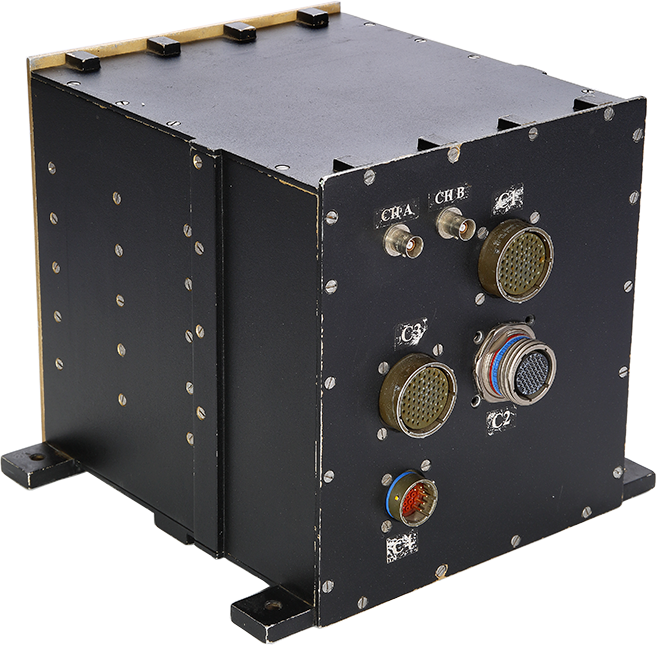 MIL-STD-1553B-SERIAL bi-directional communication interface- 1 No. Point to point serial communication RS-422 - 4 Nos. Being used as data acquisition systems for National programmes. The Stores Interface Box (SIB) is an LRU, which is required to function in a high reliability safety critical environment. Its function is to control a number of other subsystems based on commands received from two open architecture computers over 1553B Buses. The SIB is configured as dual redundant hardware including power supply to enhance the reliability. The SIB is packaged in a ½ Air Transport Rack (ATR) size enclosure with overall dimensions L=355mm, W=124mm, H= 194mm. The SIB consists of 3 PCBs of size 233.35 X 160 mm(6U Double Euro) in the main card cage and a set of 2 smaller PCBs of size 75 mm X160 mm and 65mm X 160mm in the side compartment which houses the ARINC S700 connector.The 3 PCBs in the main card cage plug into a 3 slot VME back-plane with P0, P1 & P2 connectors. The input and output signals to/from the SIB through a combination of Round shell MIL 38999, ARINC S700 Rack & Panel, and tri-axial SMA connectors. In addition set of 34 electro-mechanical relays, DC-DC converter modules and associated RF filters to derive the required operating voltages for the various circuits (+5V and isolated +28V) from the 28VDC input equipment supply also in the Rack.The SIB is dissipate around 40 watt depending on the loading and duty cycle. Weight of the unit is around 10Kg. Applicable standards are MIL-STD-810D and MIL-STD-461. Feed through Filters : 4 Nos. Connectors : MIL - 38999 - FCI Make – 6 Nos. Rack & Panel : FCI Make - 1No. Cooling : Conductive Cooling (No fans) Metal-Core PCBs. RS 422 Channels : 2 Nos. 1553 Nodes : 6 Nos. Radiation Susceptibility : As per MIL-STD 461C, 462 & Compatibility. The Power Supply to all the cards in SIB are derived through EMI/EMC 461C compliance Power Filter and DC-DC Converter. The internal Supply returns are terminated to equipment sub-star to which all ground lines (Digital, Analog).The general Grounding, Shielding, Isolation Filter etc., are in accordance with EMI/EMC norms. Bonding Resistance measurement lug is provided on front face of the LRU. Single Point Earthing outside the Box. All the cards are electrically isolated with respect to the Chassis Ground . The Unit does not require any special guide or fixtures for installation and does not have installation location constraints. This package is one of the critical avionic packages. The unit receives commands from onboard computer over 1553B bus and is responsible for switching relays, monitoring their status, sending command voltages to control systems, providing excitation supply to pressure transducers, conditioning received signal voltages and measuring parameters like system pressures and battery voltages. CCSC Unit consists of CCSC Relay section and CCSC MIU. Solid State Relays 25A : 1 No. 3PDT 25A Latch Relay : 1 No. 4PDT 10A Latch Relay : 2 Nos. 4PDT 10A Non Latch Relay : 2 Nos. 2PDT 5A Non Latch Relay : 4 Nos. 2PDT 10A Latch Relay : 3 Nos . No. of channels 4 Nos. No.of channels : 64 Nos. No. of Channels: 1 No. 4PDT 10A Latch Relay : 4 Nos. 4PDT 10A Non Latch Relay : 5 Nos. 2PDT 5A Non Latch Relay : 16 Nos. No. of channels: 4 Nos. 3PDT 25A Latch Relay : 4 Nos. 4PDT 10A Non Latch Relay : 6 Nos. 2PDT 10A Latch Relay : 1 Nos. 2PDT 5A Non Latch Relay : 20 Nos. 3PDT 25A Latch Relay : 1 Nos. 4PDT 10A Non Latch Relay : 7 Nos. 2PDT 5A Non Latch Relay : 7 Nos. 2PDT 10 Latch Relay : 1 Nos. 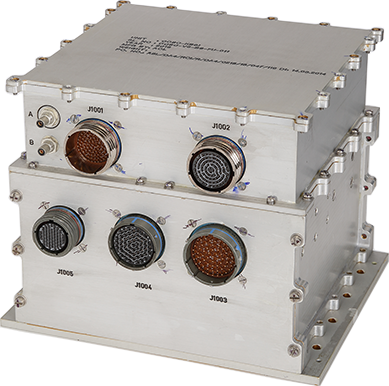 This package is one of the critical avionic packages.The unit receives commands from onboard computer over 1553B bus and is responsible for switching relays, monitoring their status, sending command voltages to control systems, providing excitation supply to pressure transducers, conditioning received signal voltages and measuring parameters like system pressures and battery voltages. Solid State Relays 25A : 1 Nos. 3PDT 25A Latch Relay : 5 Nos. 4PDT 10A Non Latch Relay : 11 Nos. 2PDT 5A Non Latch Relay : 11 Nos. On Board Computer is a ruggedized computer designed to carry out various functions, viz. control, guidance, monitor the health of sub systems. The OBC interacts with Receiver and Telemetry using 1553B bus. In addition OBC also has other interfaces like Discrete Outputs interface and control system interface (Analog I/O).OBC operates on 28 V DC input supply. The On Board Computer is based on distributed architecture system and real time data exchange is required between various subsystems. OBC is based on ADSP21060 processor. It has two channels of dual redundant MIL-STD-1553B buses. 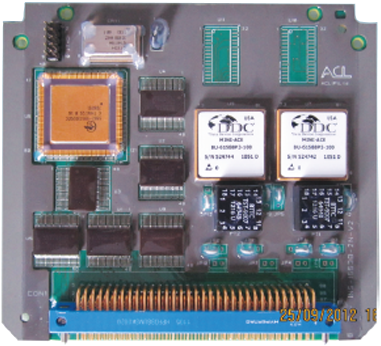 CPU Dual ADSP-21060LCWZ-160 processors with a clock frequency of 32 MHz. -Each channel is of –10V to +10V with 12 bit ADC. The ¾ Aviation Transport Rack is a LRU, which is required to function in a highly reliable and safety critical environment. The ¾ ATR is a Ruggedized Mechanical chassis. The basic concepts of focus are the inter-changeability of the LRU, high levels of Thermal Management, easy mode of operation and maintenance. Finishing : Black paint Matt finish on all external surfaces and conductive chromate conversion coating on all inside surfaces. Input Power (DC) : 28V @ 30A Range (16V – 32V) as per MIL-STD-704D. Connectors : MIL-D38999 series – 6 Nos, MIL-STD-1553B – Raychem – 6 Nos. 1553B Nodes : 6 Nos. Unit is based on Intel-80486 CPU operating at 64Mhz speed. It communicates with external units through MIL-STD-1553B Channel. It has 4 MB of Flash and 2 MB of SRAM along with 32 discrete inputs/outputs, three serial RS-422 interfaces, 16 analog inputs & 8 analog outputs, 6 timers, and One RS-232 interface. The system is a self-contained unit and operates with DC input of 28V. The unit has circular connectors on its back panel for external interfaces. The MIL-STD-1553B interface is provided through BJ-77 Connectors. Provision for future growth potential is provided though addition of a mezzanine connector. Additional interfaces can be added through the addition of mezzanine cards for custom-built requirements. State of the art components / technology are used for the design. Three 82C54 timers with provision for gating. The system comes with advanced monitor software along with powerful diagnostic software to test each and every resource exhaustively. The system also comes with highly validated 1553B library functions. 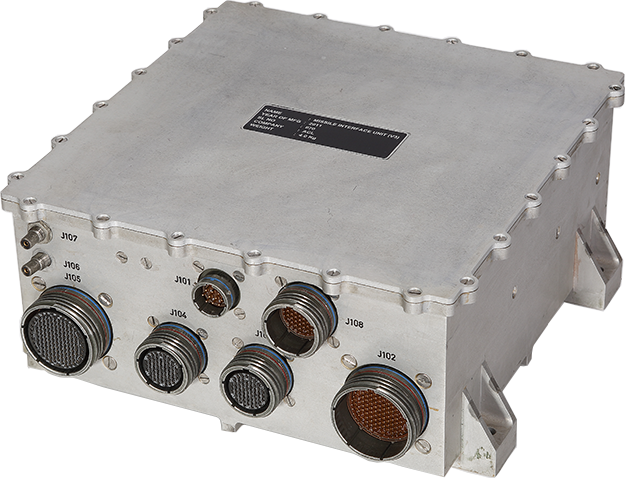 ACL-RDAS-486-1553B: Intel-80486 based Ruggedized Data Acquisition System with MIL-STD-1553B Interface. The System is Ruggedized computer of Airborne Quality. The system is based on standard bus architecture with a CPU card (87C196 based) & two slave cards for Analog & Digital resources. The computer consists of the following functional blocks (total three cards) housed in a custom built chassis. A separate power supply module (multiple output DC-DC converter) is specially mounted in the chassis. The unit operates with 28V DC power supply. The unit has circular connectors on its back panel for external interfaces. The MIL-STD-1553B interface is provided through Raychem/ Trompeter Connectors. Comes with custom built application software. The user needs to specify detailed requirements of Data Acquisition sequence and interfaces. The system comes with advanced monitor software along with powerful diagnostic software to test each and every resource exhaustively. 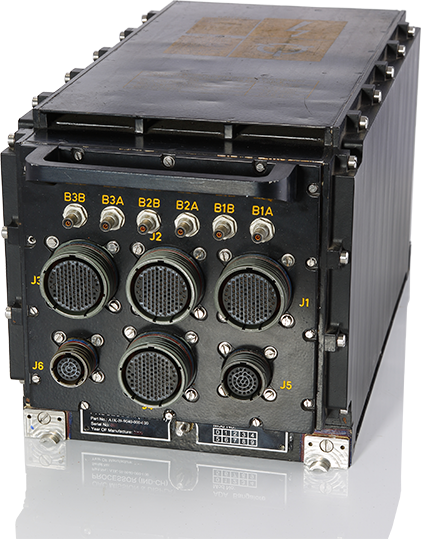 The system also comes with highly validated MIL-STD-1553B library functions . 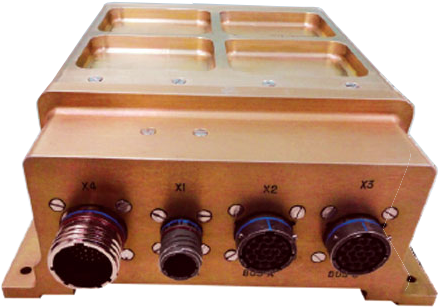 The system is a Ruggedized Airborned quality with two independent MIL-STD-1553B interfaces and 3-Tx, 8-Rx ARINC-429 channels are also incorporated. The system is based on a standard bus architecture with Intel 80486 CPU as computational engine. By using Multiple cards (two cards), high degree of fault tolerance capabilities can be achieved, with normal and alternate change over logic implementation. This computer consists of the following features housed in a custom built chassis. A separate Power Supply Module (DC-DC converter) is specially mounted on the chassis. On Board Computer (OBC) is a ruggedized computer designed to carry out various functions. OBC is a two module system based on Intel 80486 Microprocessor. Fault Tolerant Scheme in hot standby mode is employed to take care of bus-traffic. The 1553B bus of the OBC unit is organized over three 1553B Buses (B0, B1, B2) using BIU-61588 devices, configured as BC on B0, and B1 & B2 as RT (For main OBC).It uses MIL-STD-1553B interface to communicate with LC for which the standby OBC is configured in MT mode.OBC has its own internal clock through which RTC is generated. The entire software required by the OBC is PROM based. DOPs : 2 Discrete Output lines of type RS-422. SAM-AAD is an Electronic Control Units (ECU) designed using Xilinx CPLD. All the control inputs are Opto-isolated and fed to the CPLD for timing and control signal generation. On release of Power on Reset, the SAM goes into Checkout mode and checks the health of ECU. Once OBC-I command is received and health status is fine, then SAM enters into Flight mode if not, it continues to be in Checkout mode until all the errors are cleared. In the checkout mode SAM works with External supply. It consists of two PCBs: a) Logic Card (b) Interface Card. The Logic card controls the operation of squib firing and ignition circuitry with appropriate timing based on the input signals. The Interface card contains all the connectors that are required to interface with the other external circuitry. 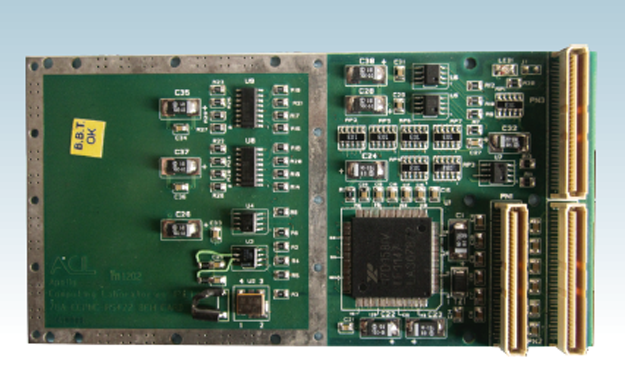 SAM-ASTRA is an Electronic Control Unit (ECU) designed using Actel’s FPGA. All the control inputs are Opto-isolated and fed to the FPGA for Timing and Control signal generation. On release of Power on Reset, the SAM goes into Checkout mode and checks the health of ECU. Once the health status is fine SAM will enter into Mission mode, if not it continues to be in Checkout mode until all the errors are cleared. SAM scans for Lift off signal and acceleration ‘g’ signal for 5 seconds. In the Checkout mode SAM works with External supply. It consists of three PCBs: (a) Logic Card (b) Interface Card and (c) ADXL card. The Logic card controls the operation of squib firing circuitry and ignition circuitry with appropriate timing based on the input signals. The Interface card contains all the connectors that are required to interface with other external circuitry. SAM-NAG/ SAM-HELINA are Electronic Control Units (ECU) designed using Xilinx CPLD. All the control inputs are Opto-isolated and fed to the CPLD for timing and control signal generation. On release of Power on Reset the SAM goes into Checkout mode and checks the health of ECU. Once the health status is fine, SAM will enter into Flight mode if not it continues to be in Checkout mode until all the errors are cleared. In checkout mode SAM works with External supply. SASU-ELM is Electronic Control Units (ECU) designed using Microchip Microcontroller. All the control inputs are Opto-isolated and fed to the Microcontroller for timing and control signal generation. On release of Power on Reset the SASU goes into Self Diagnosis mode and checks the health of ECU. Once the health status is fine, SASU will enter into Flight mode if not it continues to be in Checkout mode until all the errors are cleared. In checkout mode SASU works with External supply. The execution time of the Missile is set externally through RS422 communication link. The allowable set time is in between 20 to 200 seconds. It consists of Five PCBs: a) Processor Card (b) Interface Card (c) Power supply card (d) Sensor Block PCB and (e) Thermal Battery PCB. The Processor card controls the operation of squib firing circuitry and ignition circuitry with appropriate timing based on the input signals. The Interface card contains all the connectors that are required to interface with other external circuitry. 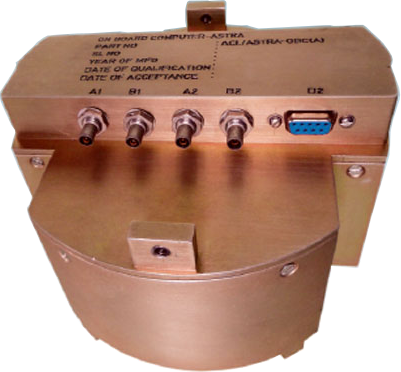 BISA-CCPMC-1553B PMC module is based on DDC’s BU-61588/BU-61688 Advanced Communications Engine (ACE), and Philips SC28C94 serial controller devices. BC/RT/MT Bus Controller (BC), Remote Terminal (RT) and Monitor Terminal (MT) modes are independently supported on each channel of the BISA-PMC-1553B module. 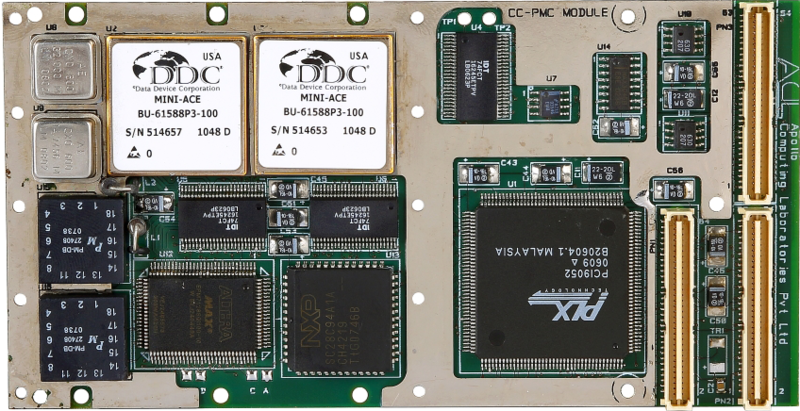 The BISA-CCPMC-1553B provides two dual-redundant MIL-STD-1553B interfaces along with Four RS-422 and an eight bit TTL parallel I/O ports on a PMC/CCPMC module.It complements ACL's latest generation of PowerPC-750 based SBC with dual PMC/CCPMC sites.The BISA-CCPMC-1553B comes with VxWorks libraries.To provide full testability, the BISA-CCPMC-1553B is supplied with Built-In-Test (BIT). BIT software routines, which provides diagnostics to give confidence in the sub-system integration.The product is available in standard air-cooled level as well as Conduction Cooled versions. Each channel may be independently programmed for BC, RT, or RT/MT mode. This option makes use of the BU-61588/61688 device to provide full support for all modes of operation. When used with BU-61588 Mini-Ace, 4K words of memory is available for message preparation and double buffering etc. RT mode supports all advanced features including single buffering, double buffering, sub-address circular buffering, programmable command illegalisation and Busy etc. Simultaneous RT / monitor mode is also supported as it is required some times for backup BC terminals. The RT address of each channel on the BISA-CCPMC-1553B may be set by Library functions. RT address is also settable through Hardware settings as per notice-2 features. In this mode the software addressing is disabled. An external trigger line is provided for each channel to allow hardware control of the BC. Messages may be pre-programmed, and then the BC can start from the point the trigger signal is activated. In RT mode this line becomes a sub-system status line, used to indicate a failure within the sub-system. 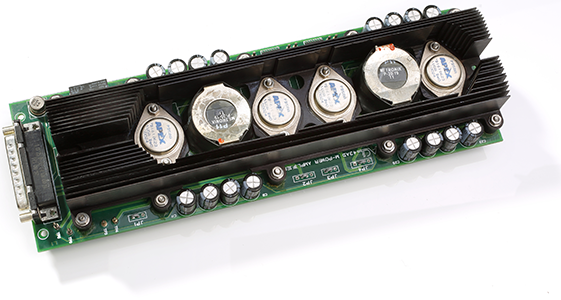 The BISA-CCPMC-1553B module is supported with Four RS-422 channels. A number of software routines are provided in VxWorks environment, to access and utilize each and every features of on-board serial controller chip. The BISA-CCPMC-1553B is provided with 8-bit TTL parallel I/O ports. Each I/O port is individually programmable as an input or output. If interrupt mode is used, on each change of I/O state interrupt is generated. To store PCI related and board configuration data, a 1024-Bits of serial EEPROM organized into 64 X 16 bit array is fitted to the BISA-CCPMC-1553B module. ACL provides BISA-CCPMC-1553B with driver and library software for VxWorks operating system environment to assist in software development. On requirement basis libraries and driver software for other Operating Systems can be provided. Note: Standard supplies will be based on BU-61588 Mini-Ace. 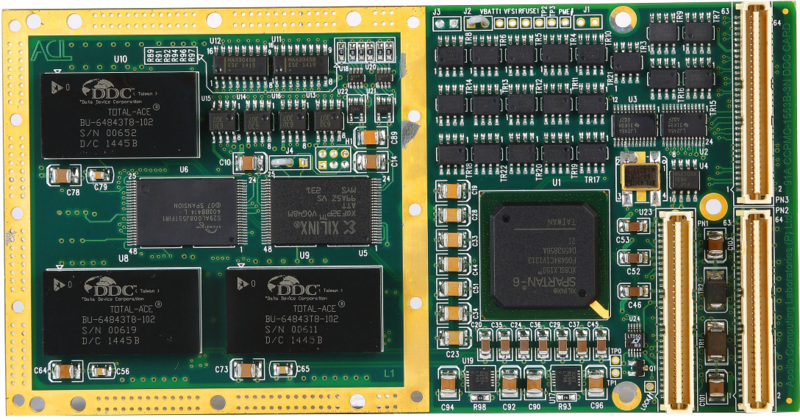 CCPMC-1553B-3Node PMC module is based on DDC’s Total-ACE and Spartan-6 FPGA. BC/RT/MT Bus Controller (BC), Remote Terminal (RT) and Monitor Terminal (MT) modes are independently supported on each channel of the PMC-1553B-3Node module. 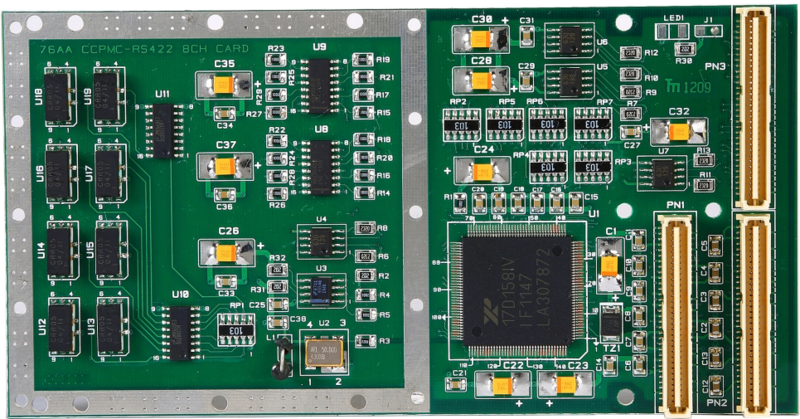 The CCPMC-1553B-3Node provides three dual-redundant MIL-STD-1553B interfaces along with Eight RS-422 channels on a PMC/CCPMC module.It complements ACL's latest generation of PowerPC-750 based SBC with dual PMC/CCPMC sites.The CCPMC-1553B-3Node comes with VxWorks libraries.To provide full testability, the CCPMC-1553B-3 Node is supplied with Built-In-Test (BIT). BIT software routines, which provides diagnostics to give confidence in the sub-system integration.The product is available in standard air-cooled level as well as Conduction Cooled versions. Each channel may be independently programmed for BC, RT, or RT/MT mode. This option makes use of the Total-ACE device to provide full support for all modes of operation. When used with Total-ACE, 4K words of memory is available for message preparation and double buffering etc. The RT address of each channel on the CCPMC-1553B-3Node may be set by Library functions. RT address is also settable through Hardware settings as per notice-2 features. In this mode the software addressing is disabled. The CCPMC-1553B-3Node module is supported with Eight RS-422 channels. A number of software routines are provided in VxWorks environment, to access and utilize each and every features of on-board serial controller chip. ACL provides CCPMC-1553B-3Node with driver and library software for VxWorks operating system environment to assist in software development. The PowerPC-750/7410 card is a 6U (233.35mm x 160mm) Conduction Cooled VME card which has a PowerPC-750/7410 CPU chip operating with an internal clock frequency of 200MHz (PowerPC-750) and 400MHz (PowerPC-7410) and an external processor bus frequency of 66.66MHz. PowerPC-750 is a high performance Reduced Instruction Set Computer (RISC) super-scalar processor. PowerPC-7410 is a high performance PowerPC G4 Series RISC super-scalar processor with AltiVec technology. Both PowerPC-750 and 7410 have 64KB inbuilt L1 Cache (32KB Instruction Cache, 32KB Data Cache). PowerPC-750 has 1MB of inbuilt L2 cache and 7410 has 2MB of inbuilt L2 cache. The CPU card has 32MB of SDRAM (4M x 72), 2MB of boot FLASH and 4MB of user FLASH. CPU card has PCI bus as a local bus and VME bus as a back plane bus. PCI bus interface is provided through the bridge chip IBM CPC-700. VME interface is provided through the bridge chip Tundra Universe-II. 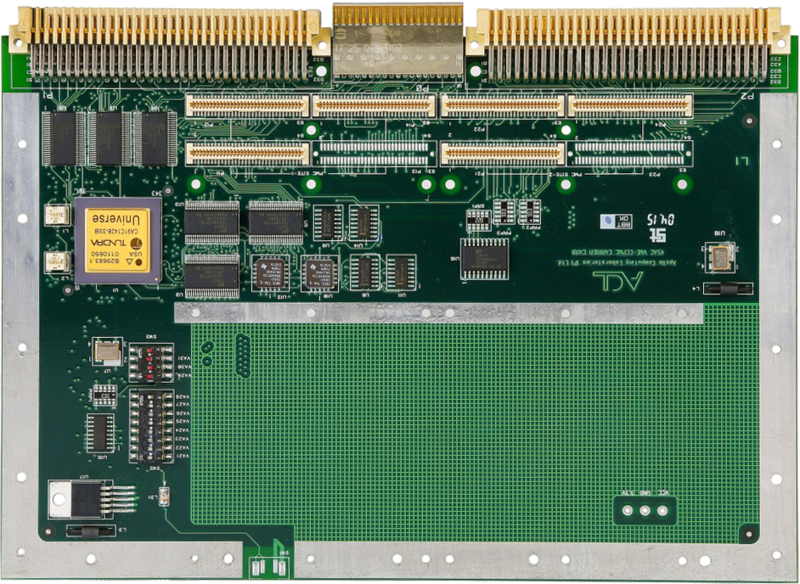 The CPC-700 provides a bridge between the PowerPC-750 / 7410 processor to the PCI bus as well as a high-speed memory controller besides having some peripherals built in. 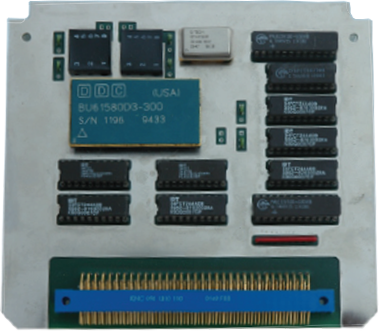 SDRAM, Boot FLASH and User FLASH are connected on the memory bus of the CPC-700. Power-on booting routines are stored in the Boot FLASH. User FLASH contains all user application programs. CPC-700 has two inbuilt UARTs (Universal Asynchronous Receiver Transmitter). Two RS422/RS232 selectable serial links are provided through these two UARTs of the CPC700. CPC-700 has two IIC bus interfaces. One serial EEPROM is interfaced to one of the IIC interface of the CPC-700. One Real Time Clock is interfaced to the other IIC bus interface. CPC-700 has 10 General-purpose timers and an inbuilt Interrupt controller. Interrupt controller supports 29 interrupts (12 External interrupts). Connectors RJ45, 9 pin D-type connector on front panel and P0, P1, P2 VME Connectors on the Back plane. * Options should be spelt out clearly, otherwise standard configuration will be presumed.ACL is continuously working on improvements of its products; hence these specifications are subject to change without any notice. Wherever the products are updated, the updated/revised version will be supplied. 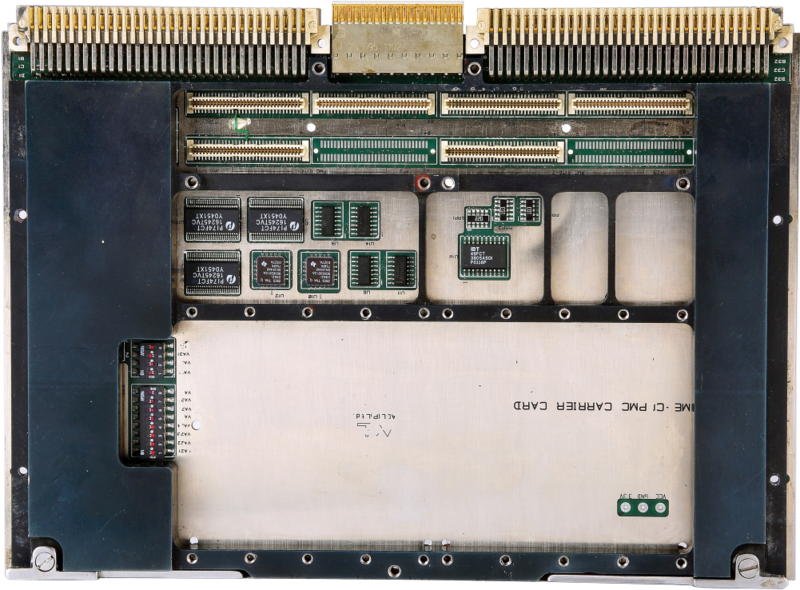 The VME CCPMC Carrier card is a 6U Conduction Cooled VME based card. VME interface is provided through Tundra’s Universe-II bridge. The card has two PMC sites, which are meant for target only operation. The PCI bus interface to access the PMC sites is provided by Universe-II. 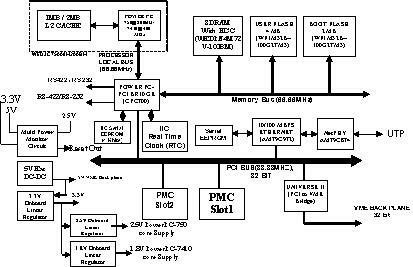 Universe-II can generate memory, I/O and configuration cycles on PCI bus. The board requires 5V power supply. Universe-II is provided with two clock frequencies 64 MHz and 33.33 MHz. The PMC sites are provided with 33.33 MHz clock frequency. Sensor Temperature monitoring & threshold levels programming done through SM Bus protocol, 2-wire serial interface. Also useful where outputs of 5V@ 40A, 3.3V@ 15A, ±12V @ 1A is required. 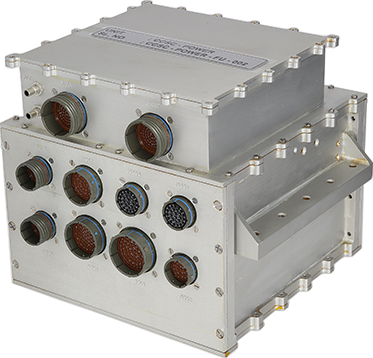 Ideally suitable for High reliability application for Military, Aerospace & Space. DC – DC Converters : Compliance to Military Standards with Output Powers Disable Control. 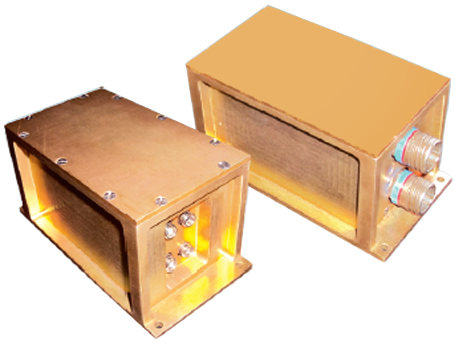 EMI Filter : Compliance to MIL - STD – 461. VME Backplane Power Connector +5V @ 40A, +3.3 @ 15A, +12V @ 1A, -12V @ 1A,-.3V @ 5A, ACFAIL, SYSRESET and return Signals. Temperature Controller Power Connector +5V @ 1.5A and return signal. Relay enabling and out enabling control signals. Operational heater power 28V @ 10A. Cooling device power 28V @ 10A. D Type 15 - Pin Right Angle Connector for +5V @ 1.5A,relay enabling and control signals. Two pin BergSticks Remote-temperature sensor for each Sensor and also for manual reset. 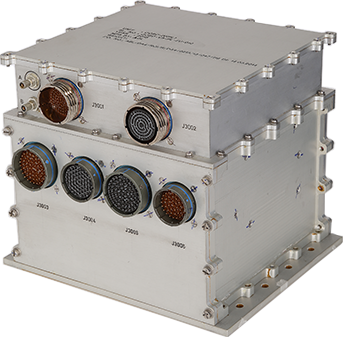 MIL-STD-1553B Single Node Bus Module is a part of INS computer. INS computer is designed to carry out various real time and non real-time functions. This module provides two Bus channels. It gets Address, Data and Control Signals from Processor module through Mother Board. It works on 5 V Supply. INS-1553B Single Node Bus Module comprising of DDC BU-61580 device configured as RT. It consists of 4K words of internal RAM. This Module consists of Crystal Oscillator which provides required clock for 1553 Bus device. 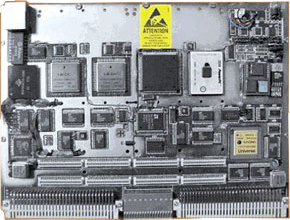 The address, data and control signals from processor card are taken through Mother Board. Data will be read or written through Data Transceivers by the processor from / to the INS-1553B Single Node Bus Module. The required chip selects and control signals are generated through PAL devices. The 1553B Bus can be connected in direct coupled/Transformer coupled configuration. Required remote terminal address is provided through latches. 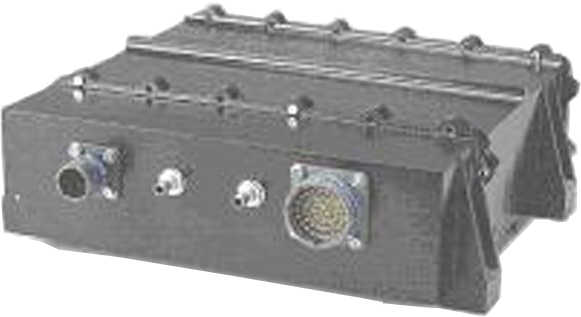 MIL-STD-1553B Two Node Bus Module is a part of INS computer. INS computer is designed to carry out various real time and non real- time functions. It comprises of complete integrated interfaces between On Board Computer (OBC) and INS computer. This module provides Four Bus channels. It gets Address, Data and Control Signals from Processor module through Mother Board. It works on 5V Supply. 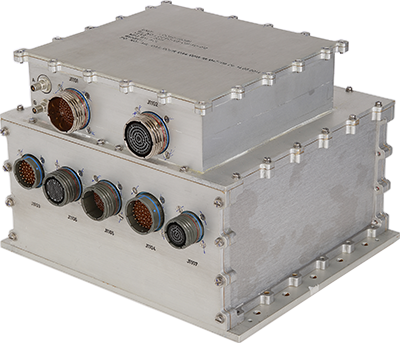 INS-1553B Two Node Bus Module comprising of DDC BU-61588 device configured as RT. It consists of 4K words of internal RAM. This Module consists of Crystal Oscillator which provides required clock for 1553 Bus device. The address, data and control signals from processor card are taken through Mother Board. Data will be read or written through Data Transceivers by the processor from / to the INS-1553B Two Node Bus Module. The required chip selects and control signals are generated through CPLD. The 1553B Bus can be connected in direct coupled/Transformer coupled configuration. Required remote terminal address is provided through latches. 1553B : BU61588P3-100 (16 MHz) - 2 Nos. NVRAM Interface : U634H256SM35 -2 Nos. 32 K Words. 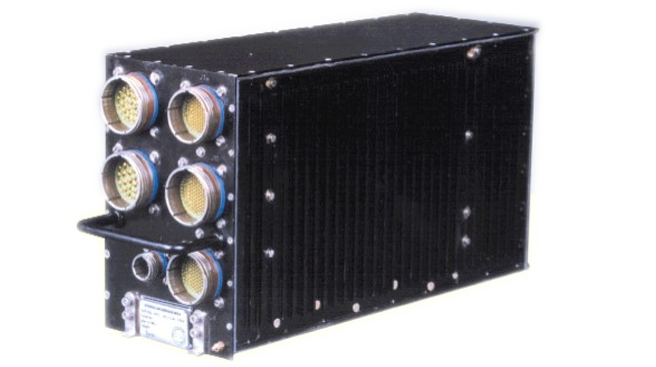 The power amplifier card (PAC) serves as the transmitter in the Expandable Decoy of Maareech Advanced Torpedo Defence System (ATDS). ATDS is an anti-torpedo system with towed and expandable decoys. The system is capable of detecting, confusing, diverting and decoying the incoming torpedoes. The decoy helps in exhausting the energy of the torpedo by running the later through long and ineffective course and prevents them from homing in to the targeted platform with it’s advanced counter-measure capabilities. The power amplifier card (PAC) consists of two stages each of 50W capacity. It amplifies the signals coming from the signal analyzer card. The amplified output is fed to two projectors ( transducers ). The frequency of operation is 18 KHz to 85 KHz. The Maareech PAC gets activated through a relay, energized by the TX_ON pulse of the Maareech SAC(Signal Analyzer card). Heat sink : Al. alloy 64430 (H30) in WP Condition conforming to IS 736. The LC-Launcher Fiber Optic Link is full duplex, redundant and high bandwidth Fiber optic interface between the Launch Controlling Station (LC) and the Launcher Interface Unit (LIU) with a separating distance of 800 meters. The LC-Launcher Fiber Optic Link consists of LC console, Launcher console and the connecting fiber optic cable system. Each of the consoles has main and standby links integrated into one unit. The LC-Launcher Fiber Optic Link is a Dual MUX/DMUX card Full Duplex system based on Industry Standard Motorola–MC68332 Micro-controller and Altera Cyclone FPGA. The inputs / outputs of the MUX/DMUX unit are 6 full duplex RS422 channels, 40 Digital I/O’s, 1 Voice I/O and 1 unidirectional Video channel. The Voice, six RS422 channels and Digital I/O’s are multiplexed to a 2 Mbps serial data stream and routed through one core of the Fiber. MUX/DMUX card has BD32 port for Micro-controller/ Flash/ SRAM Testing / Debugging and a JTAG port for FPGA software Testing / Debugging. Flash Memory is used for storing Application software. SYNC,ERROR, STATUS indication through front panel Lamps. Manchester Encoder/Decoder, SYNC generation, Frame Reconstruction, Mid-bit Sampling technique & CRC-16 techniques are used while Framing & Deframing. Each MUX/DMUX unit operates on DC power supply of 28V ±4V with necessary EMI filtering and isolation. The 1300nm Multimode Optical Transceiver is used for transmitting and receiving multiplexed data. The maximum distance of transmission is 2 Km. A 850 nm Video Transmitter and Receiver Module is used for Unidirectional video Fiber communication. The maximum distance of transmission is 5.2 Km. Multimode four core 62.5/125µm Tactical Ground MIL grade cable is used as communication media between LC and Launcher Consoles. 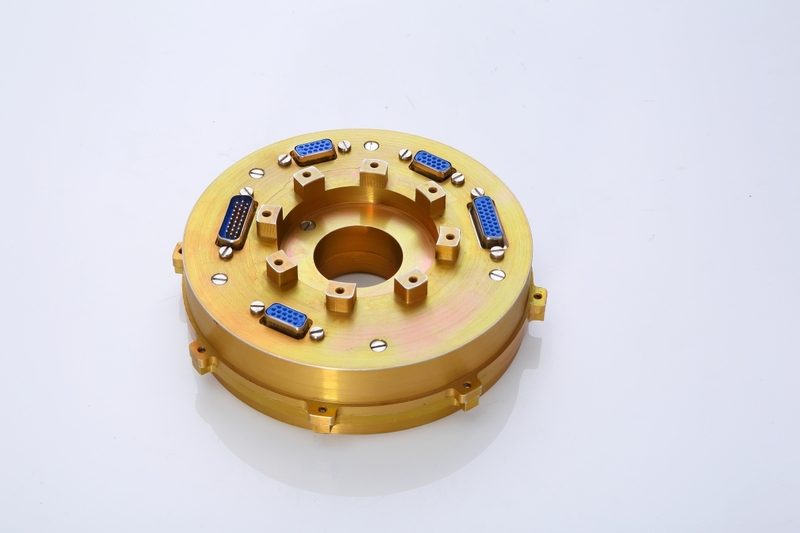 The first two Fiber cores are used for transmit and receive data,third Fiber core is used for video data transmission and the fourth one is spare. It is used as fiber optic Communication link between LC Console and Launcher Console for National programmes. This system Provides the Fiber Optic Communication interface between On shore Data logger and Under water mine. This system is based on FPGA, communication and Response is supported through RS-232 I/F with 9600 Baud rate. It receives the commands from the onshore Data Logger in Optical form with the Speed of 4Mbps and converts the same data into differential electrical form and transmits to FPGA card & vice versa. Operating Temperature : -40°C to +85°C. Distance : Up to 40Km. Fiber connector : SC Duplex. Fiber cable : 9/125 μm, 1310/1550 nm wave length. FOIM receives differential data from Optical Transceiver card and process the data commands to Mines. Receives Acoustic noise (ANDAC) Differential data of 16 bit and 100K samples. 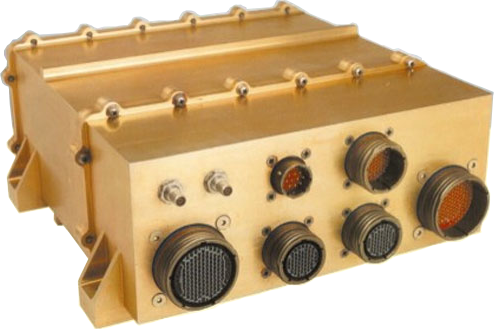 Transmits / Receives RS232 data to / from Mine system. Power supply Card is used to generate 5V DC supply from Input voltage of 18V to 32V DC. 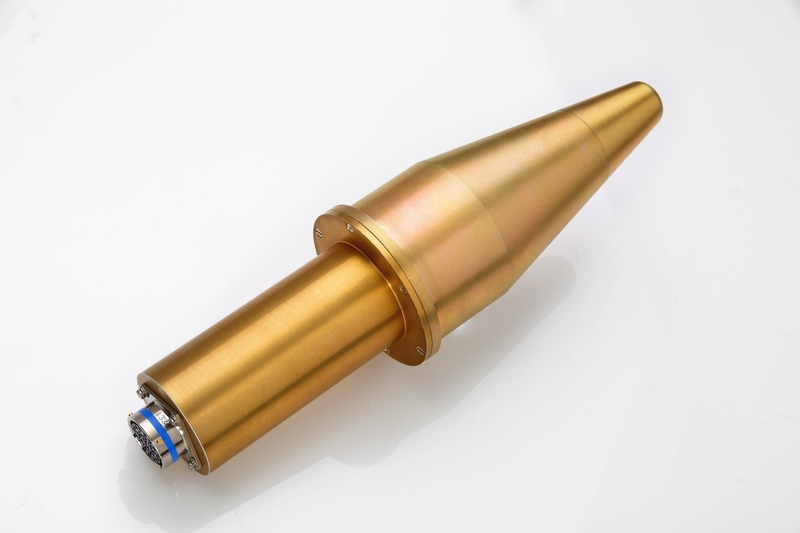 Reduce EMI / EMC Noise and Spikes. Fiber Optic Connectivity provides full duplex, Redundant, High Band width interface between Launch Controlling Station (LC) and the launcher interface unit for Various Applications with a separate distance of 800 meters. Both multimode and single mode converter boxes of 850nm/1310nm/1550nm wave length with FC/SC/ST Type Fiber interfaces are available. Differential Electrical interface is provided. No. of channels : 2 Nos. CCPMC RS-422 Card provides 8 channel RS-422 and 8 Discrete I/O lines. The RS-422 Receive lines are optically isolated and Discrete I/O's are Open/Close type by using Mechanical Relays.The CCPMC RS-422 Card conforms to the VITA 20-200x draft 1.15 CCPMC standard.The CCPMC RS-422 form factor (143.75mm x 74mm) uses only one CCPMC slot on the host and can easily be plugged onto any host processor (VME or otherwise) that supports CCPMC. Comply with IEEE 1386.1 PMC Standard to serve as Mezzanine Board for a Power PC VME host conforming to IEEE 1101.2. 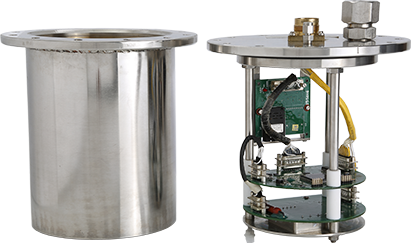 Conduction-cooled as per VITA conduction Cooled PMC Standards. Eight Channels of RS422 Standard Serial I/O baud rate up to 6.5Mbps. PCI Interface will support 8/16 / 32 write Cycle with Zero wait state. Built In Test : Test Software / firmware will cover detailed Hardware testing. Serial I/O : 8 channel RS-422 Serial port. Software Programmable baud rate generator. Digital I/O : 8 channel relay contacts open or closed type, Contact rating 5V @ 1 Amp. EEPROM : CCPMC RS-422 Card has a serial EEPROM of 2KB for configuration. POWER : 5V @ < 1 Amps. CCPMC- RS422 module is designed to fit on all air cooled PMC fitted host cards as per standards stipulated. Components on a CCPMC RS-422 conforms to the envelope specifications as defined in IEEE P1386 common Mezzanine Card Specifications. 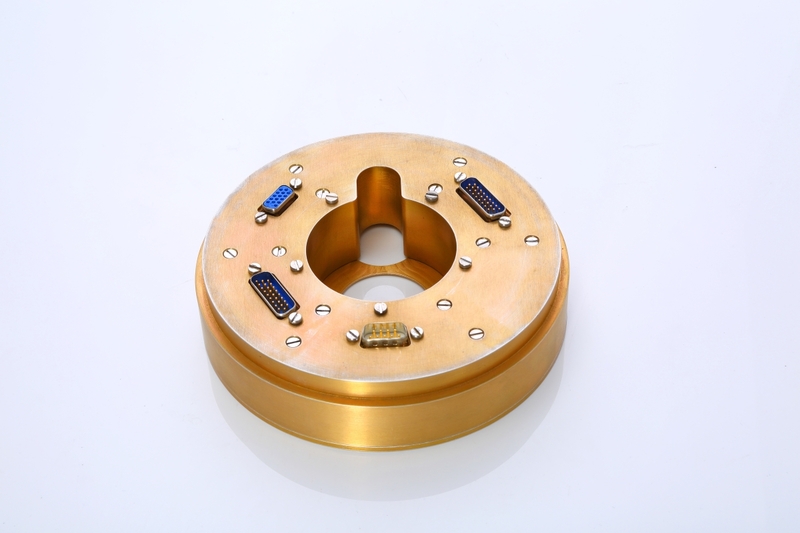 The CCPMC RS-422 is of single width. 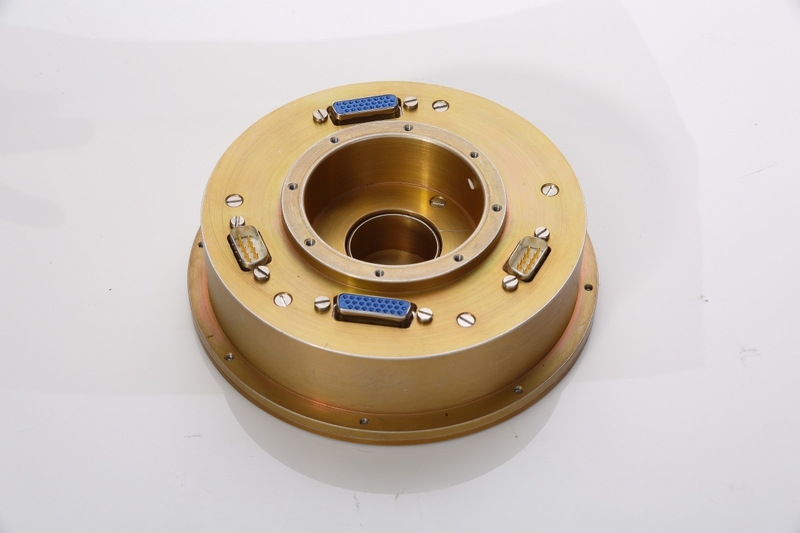 All the standard mounting holes are provided. The mandatory thermal interfaces are provided in the design of CCPMC- RS422 module. PMC RS-422: PMC card with 8 channel RS-422. PMC RS-422-DIO: PMC card with 8 channel RS-422 and 8 I/O's (open or close).